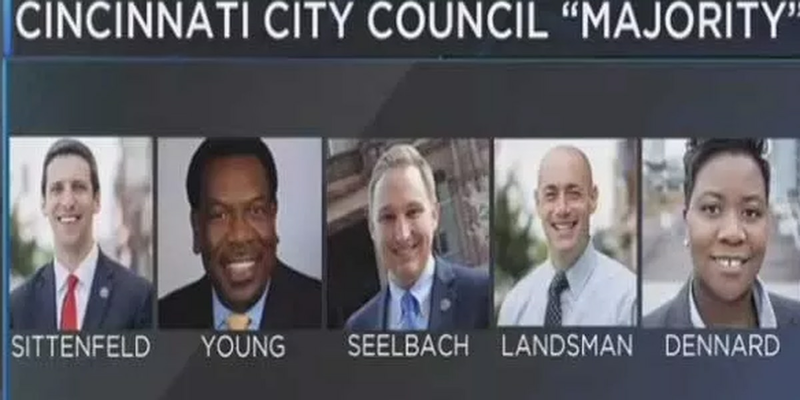 CINCINNATI, OH (FOX19) - A secret text message string among five members of Cincinnati City Council reveal P.G. Sittenfeld urged City Manager Harry Black to seek counseling and Councilman Wendell Young calls Mayor John Cranley a liar. The March 16 text messages were released to FOX19 NOW Wednesday morning by the city's supervising attorney less than two hours after we filed a public records request for them. They also are being released to others in response to a government watchdog group alleging in a lawsuit filed last week that the majority of Cincinnati City Council violated Ohio's Open Meeting Act and the city charter. The suit names Sittenfeld, Tamaya Dennard, Wendell Young, Chris Seelbach and Greg Landsman. It describes the Democrats as "a cabal of five rogue members" of Council holding illegal, secret meetings via email and text messages to discuss John Cranley asking Harry Black to resign. "Team I knew there was one thing I meant to bring up that I forgot to on the call," Sittenfeld wrote in a group text message string to Dennard, Young Seelbach and Landsman. "4 of us at a time need to have a conversation with Harry about things he needs to do to improve. I've overtly told him I believe he needs to seek some sort of counseling. But he needs to hear it collectively from us, and to frankly understand that his job depends on correcting certain things....should we schedule a meeting with him for next week - with all of us minus Chris, who will be OOT (out of town)?" That discussion should be held at a later date, Young responded. "Not now please," he wrote. "I think he would view this as a softening of support. May I suggest we reserve that conversation for after we get through this process?" Sittenfeld texted back: "Wendell, I'm OK waiting if the others agree. HOWEVER, it's a conversation that must be had - sooner rather than later. Harry struggles with some things and needs to know we support him, but also bring certain expectations. I'll defer to the group on timing." "I too will abide by what the group decides," Young wrote. "For me there is a recognition that Harry is under an enormous amount of pressure. I worry that he would view the conversation as us piling on. The timing isn't good." In other texts, Young called Cranley a liar: "Don't forget that he will lie in a heartbeat." "Just got a call from Harry's letter and then from Harry regarding their being told by John that I am the fifth vote on a separation package for Harry," Young wrote. "I haven't spoken to that little sucker. He just flat out lied to Garry and his lawyer. Is it too late to insert into the letter something making it clear that 'we' do not support a buy-out for Harry?" Reached for comment, Sittenfeld released a statement that didn't specify the type of counseling he thinks Black needs. "There are no sentiments in these texts that I haven't expressed publicly. And bluntly, everyone has much more urgent and more important things to focus on, first and foremost, reforming our emergency response system." Young declined to talk about the lawsuit and said emails and text messages related to it "are what they are." "I will not vote for a buyout," he wrote in another text. "I'm firm! Harry gets what his contract calls for. Nothing more. The police chief is next. Watch." "Agree," Landsman texted in response. In a later message, Dennard wrote of the mayor: "Divide and conquer is his thing...He tried to do that twice to me this week." "The citizens and city workforce deserve better than being managed by somebody that, according to City Council, has "struggles" that require "counseling." Given the stakes of properly working city services, Council cannot hold the manager to a standard lower than a typical city employee." Vice Mayor Chris Smitherman called the text messages "damaging" and "horrible" and said he fears there are more to come. "The text messages confirm that P.G. Sittenfeld is the ringleader of the five," he said. "It also confirms that P.G. Sittenfeld has been working to undermine the mayor and the citizens of Cincinnati who voted for him, voted for John Cranley. I am disappointed in his use of the word 'team.' All 9 of us are on a team. He presents to the city I am this civil person, this is about civility. But this is just a power grab by P.G. Sitenfeld. That's what this has all been about and now we all know the truth." Councilmember Greg Landsman spoke out about the text messages saying "Texting like that was clearly a mistake, and I feel very badly. It won't happen again." Emails attached to the lawsuit are described as documentation of the law violation, including two press releases about the city manager from the five council members. One email is titled "Draft Letter for Council Majority to release" and another one from Seelbach to Landsman has a subject line "Revised Letter" and indicates they are all texting each other on a group string. "Greg. Are you getting texts. Everyone has approved on text chain. Are you good?" At the time, Seelbach was in Puerto Vallarta, Mexico planning his wedding, according to his Twitter account, and Landsman said in a radio interview was in Israel on business unrelated to the city. One of the press releases, signed by the five council members, states they wouldn't encourage or assist "the intentional denigration of another black leader in our community." The second release states they do not support a more than $400,000 severance payment to Black that he and the mayor agreed on, which would fork over more than eight months of his salary than his current contract stipulates. The council majority has refused to fire Black, saying Cranley's objections to him are personal and political and not based on his job performance. Black said he wants to stay. Council has approved a plan for Dennard and Councilman David Mann to lead an investigation into allegations of misconduct by Cranley against Black. That is on hold now, however, due to a legal challenge from our news partner, The Cincinnati Enquirer. Attorney Brian Shrive of the Finney Law Firm filed the suit in Hamilton County Common Pleas Court on behalf of Mark Miller as a citizen. Miller is the treasurer of the conservative group COAST, Coalition Opposed to Additional Spending and Taxes. Attorney Chris Finney founded COAST. Shrive, in the last election, donated $1,100 to Vice Mayor Christopher Smitherman's campaign. Shrive said he is now seeking all the individual communications regarding City Manager Harry Black. That request would include the mayor's texts about the situation. A spokesperson for Cranley said he dropped the cell phone in a hot tub while he was at the gym. Smitherman supports Black resigning with the larger settlement. The suit asked the court to prohibit council from conducting any secret meetings or commit further violations of the Open Meeting Act and to declare any action from them invalid. Shrive said Wednesday morning he has been working with city officials to settle the suit, but they still have work to do. "I remain hopeful that we will be able to resolve this quickly," he said, "but the city is going to have to be more transparent and be more willing to comply fully with the Open Meetings Act. "At the end of the day we expect a court if it goes to court to enjoin these council members from any further violations of the Open Meetings Act, not just group text messaging."